The stunning Skiathos Palace Hotel is located at a distance of 8 minutes on foot from the Maratha Beach. 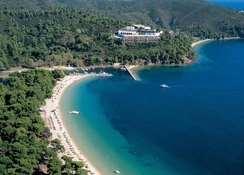 An upscale property, Skiathos Palace Hotel is located on a pine-covered hillside at 3 km from the Koukounaries Beach. The hotel features a huge fresh water swimming pool with parasols and sun loungers for relaxation. Located by the beach, this beautiful property is a modern complex hotel offering luxe accommodation. Guests can relish some fantastic cuisines and refreshments at the restaurants and bars here. Featuring an elegant location, the Skiathos Palace Hotel is an excellent choice for couples, honeymooners and families wanting to have some fun together on this Greek Island. At an 8-minute walkable distance from the Maratha Beach, Skiathos Palace Hotel offers a beach shuttle bus to the guests. It is located 13 km from the Skiathos Airport. Guests can visit the 1794 Evangelistria Monastery at just 14 km from here. The main town and the airport are located within a distance of 12 km from here. The rooms are airy and offer free Wi-Fi and satellite connectivity. Guests can enjoy some snacks between meals at the minibars in each room. The rooms feature sea-view balconies. The upgraded ones add living areas and the verandas have sun loungers. The suites also offer a magnificent outdoor private Jacuzzi. The suits come in with extra bedrooms and bathrooms. The hotel offers free stay to kids below 12 years old. There is free room service offered here. The rooms are quite modern and comfortable. They are equipped with individually controlled air conditions. The breakfast buffet is complimentary. Guests can relish sumptuous meals at the 2 casual restaurants here. The 3 bars at the property serve some of the choicest drinks in town. The hotel provides an option of outdoor and indoor dining. American breakfasts and buffet dinners are cooked by master chefs at the property. Guests can sample Greek cuisine at the hotel’s rooftop grill restaurant which serves traditional Greek cuisine along with some panoramic views. The hotel’s pool bar serves delightful light snacks and bites. For cocktails, head straight to the Indoor Bar here. 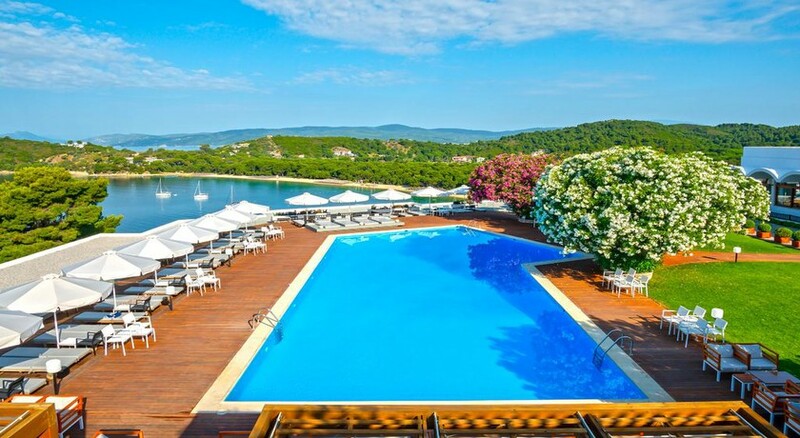 Skiathos Palace Hotel features a huge fresh water swimming pool with parasols and sun loungers for relaxation. The private guests here can have some fun enjoying a game of tennis or they can go for hiking. Kids can entertain themselves at the children’s playground area. The hotel is located by the Maratha Beach which is great for some lazy relaxation.